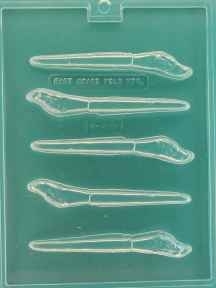 Make some delicious paint brush-shaped chocolates right in your own kitchen with East Coast Mold’s Artist Paint Brush Chocolate Mold. 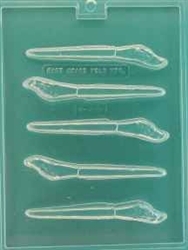 This mold comes with 5 cavities, measuring ¾” x 5-1/2” x ¼” – the perfect size to decorate a table or serve at a party. East Coast Mold’s products are FDA approved and designed to withstand up to 150 degrees F. Get yours now! Each piece is 3/4" x 5-1/2" x 1/4"
The mold worked ok. It was cracked when I received it, but I needed the product immediately so I didn't have time to return. It cracked again when I was using it. Good mood, quick delivery, fantastic customer service. Answered all my questions promptly. I was looking for artist paintbrush chocolate molds locally where I live, I could not find them anywhere! I'm so glad I came across these! They are exactly what I was looking for!